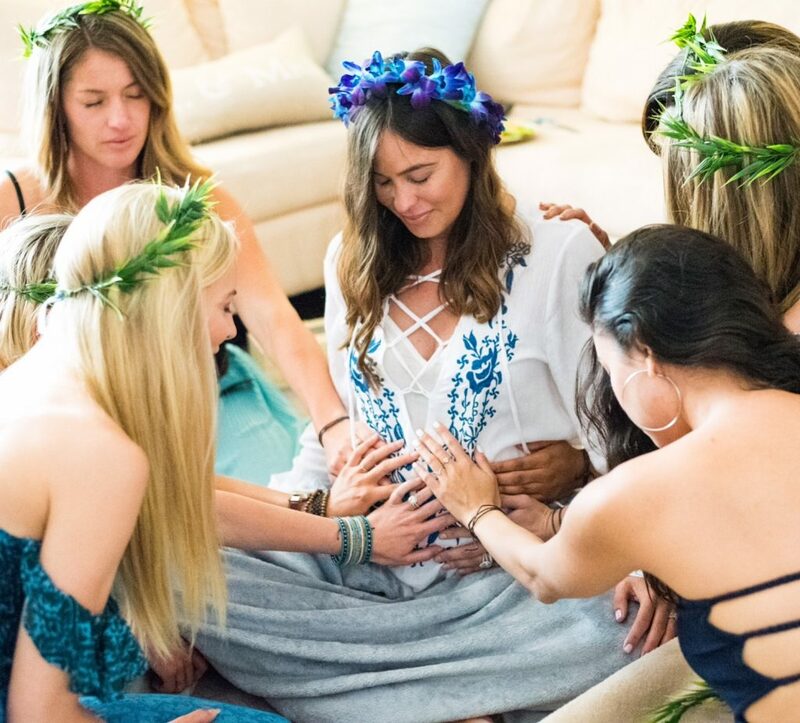 Raquel explained that she wanted the day to be about getting poured into as a mother since baby showers are all about the baby. I thought, “YES, this is what all expecting mothers need.” So, I took the general idea of a Mother’s Blessing and designed the day rooted in our faith, the Word of God and prayer. The itinerary I created for the the most recent one I hosted is below. You can use it as a template and tailor it as you like! The Mother’s Blessing I hosted for Raquel included more detailed touches, included gifts, was during the day time, had multiple hosts and was customized to fit her. She writes all about it here. 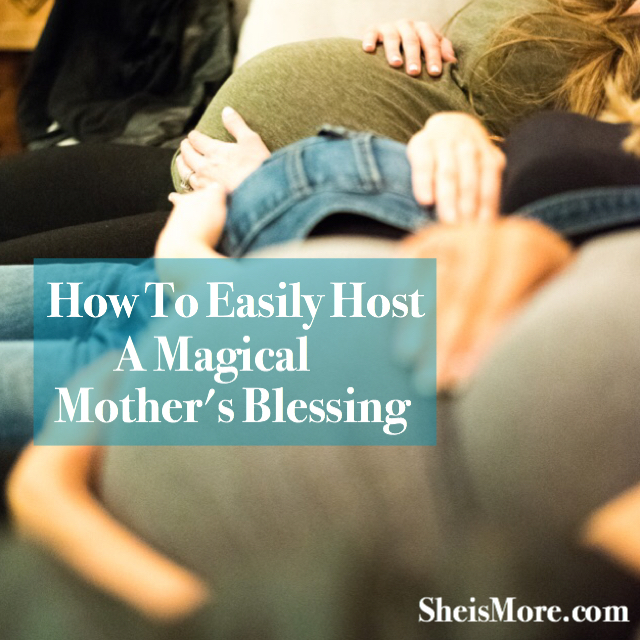 I’ve been so excited to be on this pregnancy journey with three of my close friends and I was eager to host a Mother’s Blessing evening for them. When it comes to hosting, I love to create cozy, candlelit spaces. I also do not enjoy details or logistics, so I decided to position their evening as a relaxed night in with a plan to bless the expecting mamas. If you don’t consider yourself a great host or hosting intimidates you, I completely understand. I’ve definitely been there. Having a clear itinerary and plan helped me from feeling overwhelmed by envisioning the day and it also helps the guests feel guided.. It is important for a day/evening to flow with a timeline. I’ll show you how I put together a Mother’s Blessing and hopefully make it easier for you. All you need is a lot of love, a plan, and a space. The photos below are from Raquel’s Mother’s Blessing as well as the one I hosted for my three friends (Brittany, Claire, and Tami). They were beautifully taken by Alyssa Campanella. I asked all the guests to come prepared with a letter to read to the mother(s) out loud. Before writing the letter, I encouraged them to pray and ask the Lord what He wanted to say to each mama and to come prepared with any Bible verses for her. This gives the guest time to thoughtfully reflect on meaningful words to speak. It also ensures there won’t be any rabbit trails or tangents. Please come prepared with a letter for each of them that you will read aloud. (The power of life and death is in the tongue. Speak life. Proverbs 18:21) Be encouraged to take time asking the Lord what He wants to say to each woman and ask for images, senses, words or verses about their children. This is a night for us to gather and arm them with the truth of what Heaven says about their calling to be a mother, their children’s identity and their deliveries through life speaking and prayer. Food and Beverage Spread: My food spread included; Veggies and hummus, a fruit platter, dark chocolate covered caramels, dark chocolate covered pretzels, popcorn, an assortment of cheese and crackers, peanut butter filled pretzels, chips and guacamole. I had the guests bring wine and I provided sparkling flavored water and organic lemonade. I wish I had photos of it because it was so pretty! 5- 5:30 Guests arrive. Graze on snacks, mingle. Hosts explains Prayer Charm Bracelet activity. 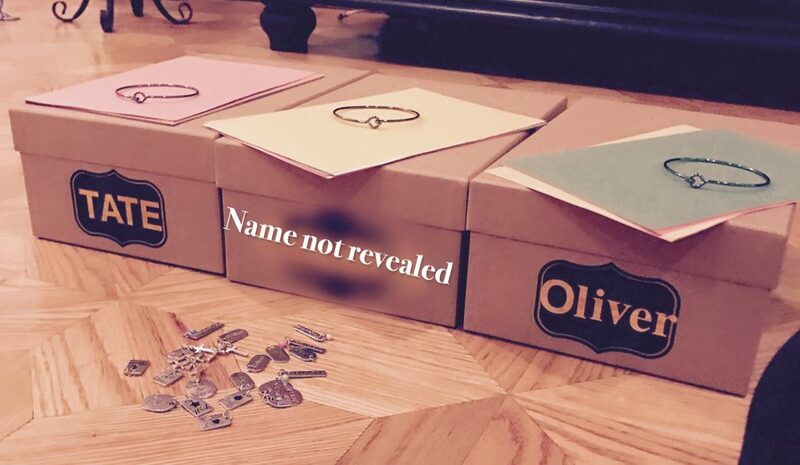 Materials: A photo box with baby’s name on it, construction paper, markers, a charm bracelet and multiple charms. I got them all from Michael’s. Instructions: Have each guest choose a charm and then write a prayer on the construction paper themed around the charm. 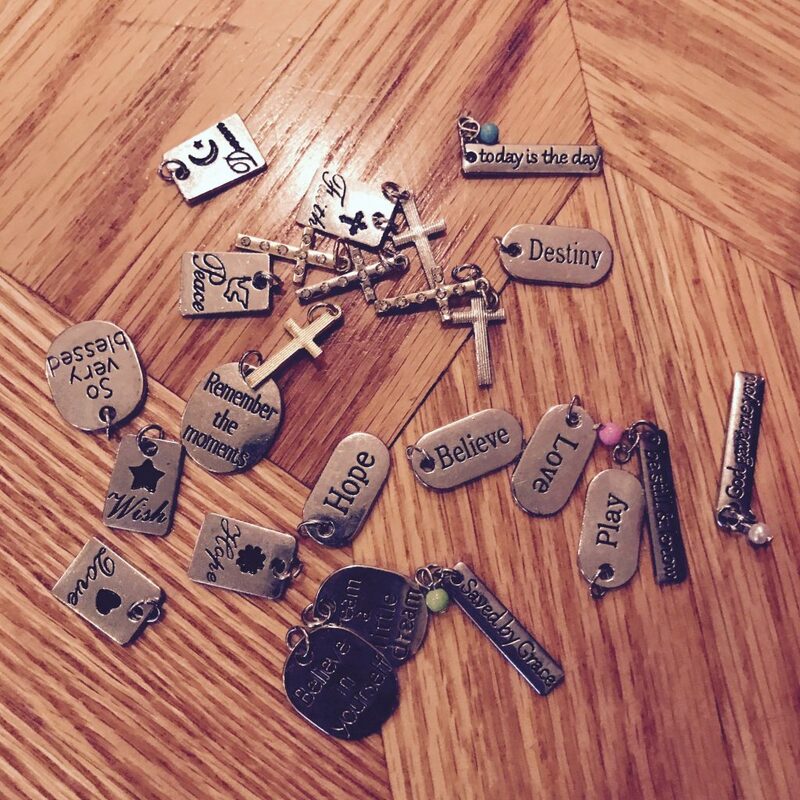 Place prayer in photo box and the charm on the bracelet. When mother goes into labor, she will wear the bracelet and be covered in your prayers. 5:45– Invite everyone to take a seat with their drink and /or plate. Host opens night in prayer. Host explains the evening: To bless mother and baby through life-speaking, for the mother to share her journey with no interruptions, cover them and delivery in prayer. 5:50 Mother: Share journey of her pregnancy. It’s really nice for the mother to have an interrupted moment where she gets to share what’s on her heart with her closest people. If she’s having a hard time, you can ask her questions like, What are you most excited about? What are you fearing the most? What surprised you the most? How have you seen the evidence of God through this journey? Have each guest read their letter out loud. It’s a good idea to have box of tissues on hand. 7:05 Take 5-10 minutes for guests to take break/use bathroom/get a refreshment. 7:10 Prayer time over mother, baby and delivery. I had each mother sit in the middle of the floor on a pillow. We sat around her in a circle and laid hands on her as each one of us prayed blessings over her. I hope this helped you! You can put together your own variation of a Mother’s Blessing. If you’re feeling a stirring to bless your expecting mama friend in a deep, meaningful way, this is it. All the mamas have been so thankful and said they were overflowing with love and gratitude afterwards. This Mother’s Blessing was a memory of a lifetime. Raquel’s delivery was completely supernatural. In only two pushes, her baby came into the world. We prayed for the same thing over these three mamas and are excited to see how God is going to honor our prayers. There is nothing better than getting a soul, spirit and heart shower and bathing in prayer…especially in such an important season of life.